I was raised at my grandmother O’Brion’s kitchen counter kneading dough on her (now mine) huge cararra marble slab. She showed me how to make gorgeous pizza dough and loaves of fresh bread in the traditional way. Fast forward to me with two babies and grand ideas of making fresh bread for my family. That lasted about 10 hot seconds! I quickly discovered that time was limited with two toddlers. I only own a handful of kitchen appliances, but the ones I do have, I adore and use often. 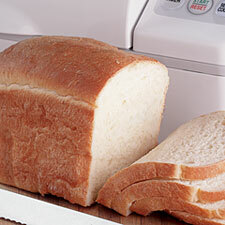 I bought a bread machine about 9 years ago on Overstock.com for about $60.00 and it was the best 60 bucks I’ve ever spent. I use it a lot. I know some people think it’s “cheating” and others think they are difficult to use. Okay, maybe, just maybe if you’re a purist, it is sorta cheating. But, I’m more inclined to make a loaf of homemade bread with the machine, than I would if I had to knead bread dough by hand. Plus, my slightly arthritic hands are thankful. I love that I can put a loaf of bread together in about 10 minutes and leave it, go out, take a nap or whatevs. In under three hours I have the best bread. As far as bread machines being difficult or rather their loaves not coming out very well, here are my thoughts on bread machine usage. 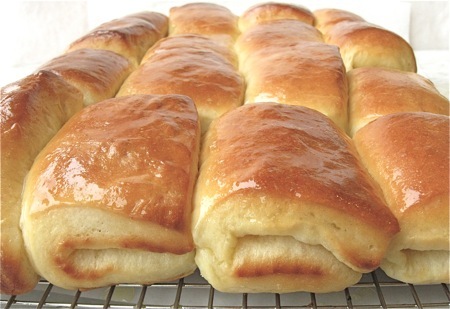 Use good quality yeast like Fleishman’s and a superior bread flour. 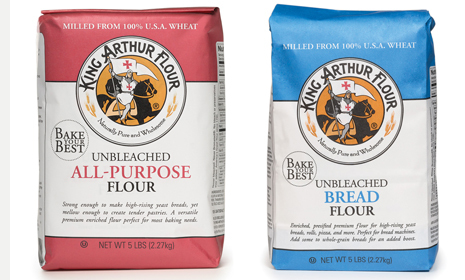 I only use King Arthur Flour because I have found that cheap flour results in a poor bread quality. Follow the instructions I will provide and you should have nothing but gorgeous bread, every single time! 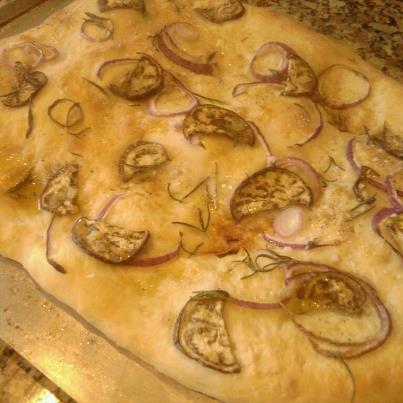 I’ve used EVOO thinly sliced red onion, eggplant and fresh rosemary and coarse sea salt. 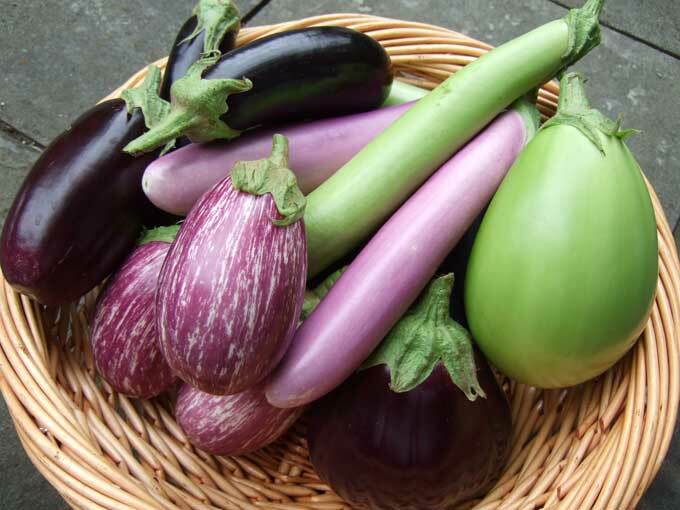 However, there are many lovely vegetables and toppings that you could use. Summer squash, tomato, ham or pepperoni just to name a few. 2. Lightly oil a flat pan or a round pizza pan. Depending on the shape you prefer. 3. When the cycle has finished turn your dough out onto a lightly floured surface. 4. Punch the dough down to flatten it slightly. 5. Shape the dough into your pan shape. Try not to pull and stretch the dough too much and to not over flour the dough. I find that giving it some time to rest and relax helps to shape the dough. I usually give it about 20 minutes covered with plastic wrap. 6. Pre~heat the oven too 400 degrees F.
7. Uncover your dough and continue stretching it to form your desired shape. 8. Poke the dough to create dimples all across the surface and let rise again. About 10 minutes. 9. Drizzle the surface with EVOO and sprinkle with coarse sea salt and your toppings. Bake for 20 – 25 minutes till golden. Have all of your ingredients out and your measuring tools ready to go. The idea is to work fast. I always pre~ measure my flour into a bowl. That way I am not loosing track of how much I’ve added and so that my liquid does not get too cool. Put all of your wet ingredients into the bread machine first. Oils, butters, milk or water. Make sure, sure that your wet ingredients are not cold, or hot. They should be lukewarm. Remember yeast is killed with hot liquid and it will stop the bread from rising properly if it’s not the correct temp. After you put your wet ingredients in, add your flour. Make a dimple in the center of the flour. This is where your yeast goes. Then add your salt and or sugar separately to a corner. They should not touch the yeast or each other! Separate corners for sugar and salt. Do not stir anything as you are adding it. Just layer. 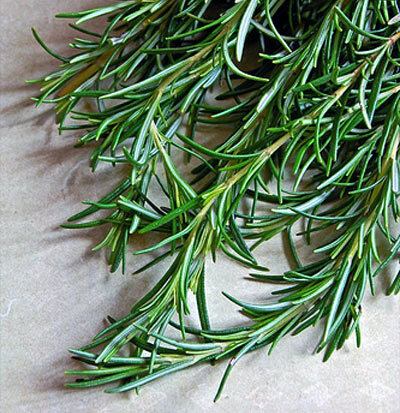 If you are adding cheese, herbs, spices etc. I usually just sprinkle those over the whole thing before I hit start. If however you’re using fruits or nuts there is a special cycle for those types of breads and your machine should give you a warning beep to add them in at a certain point. Do not delay in starting the machine. 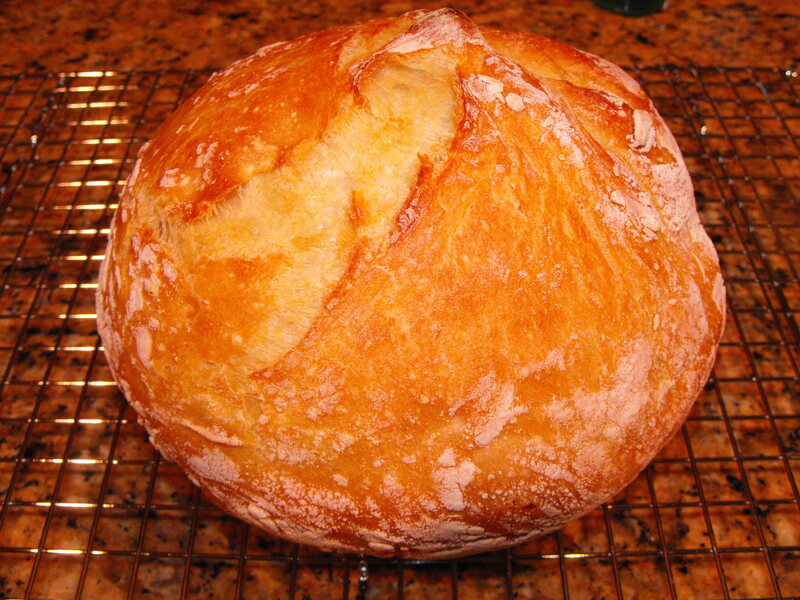 Your liquid will get too cold and your bread will not rise properly. Do not open the machine when it’s kneading or rising ( well, it’s okay to peek! But really just a split second) because again you’ll loose heat and it won’t rise properly. Honestly, after you’ve made a few loaves you’ll get to know how the dough should look and feel. On an occasion I’ve had to add liquid or flour to remedy overly sticky dough or dough that was too dry. I have found this only happens when using random recipes on the web I’ve not tested. 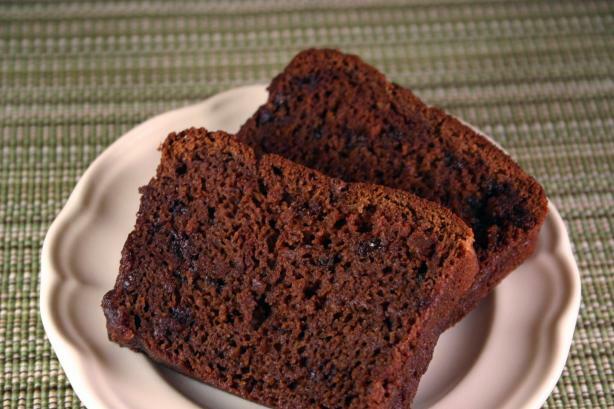 It’s never happened when using a good resource such as King Arthur Flour’s recipes online.